Through our office windows earlier this week, we watched as the snow fell. But we double-checked the calendar and it is indeed spring. With spring comes a few reminders. We have already started scheduling yard clean ups. Every year, tree branches and snow plowing debris end up on some of the yards of our multifamily properties. For the second year, we have contracted with Rocky Acres to handle this clean up and that should be happening pretty soon. Of course, this means that lawn mowing season is not far behind. We just want to remind everyone that to help keep our properties looking good, we ask that you work with us and the people mowing lawns. Please don't store items on the lawn. Per your lease, keep things like grills and outdoor furniture on your patio when not in use. Also, we see a lot of people moving in and out during spring and summer. We understand the convience of pulling the moving van right up to the door, but remember typically in spring we have a lot of rainfall which leads to some pretty soft yards. Bringing the truck up on the lawn could save you a few steps, but it could also create some significant ruts and yard damage. So, we ask that you refrain from doing that if you are moving in or out. Spring leads to summer and summer leads to the need for air conditioning. We have noticed a few tenants have put covers on the outside of their wall-unit air conditioners over the winter months. This does help with winter drafts and winter heating bills. However, for your safety, please remember to remove those covers before turning the A/C on for the first time. We are also putting together our capital improvement project list for the building season. In order to continue to provide quality housing, from time to time major improvement projects are needed. These may include roof replacement, window replacement, landscaping work, etc. If we are going to be doing some work around your building, we will make sure to give you written notice of what we plan to do and the time frame for the work. Depending on the project, there could be some noise for a few days, or we may need parts of the parking lot left clear for construction equipment. We do ask that you be a little patient with us if this impacts you. We are only trying to make your home better. In the meantime, May is almost upon us. We don't mind the snow in winter, but we ask all of our tenants to THINK SPRING to keep future snow falls away. 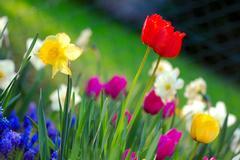 Have a great spring!! !